Here is a quick tip that I couldn’t figure out until after a good while searching the web. If you’ve got a mobile project and are using Adobe AIR 3.5 or 3.6 or 3.7 you may see this error when trying to publish to your device from CS6: “Device Error: Please check if there is enough space on the device”. The issue is the App ID name under the ‘development tab’ in the AIR for iOS settings. If you simply “re-browse” to your provisioning profile, the App ID name will fix itself and then you won’t have that ‘not enough space issue’. 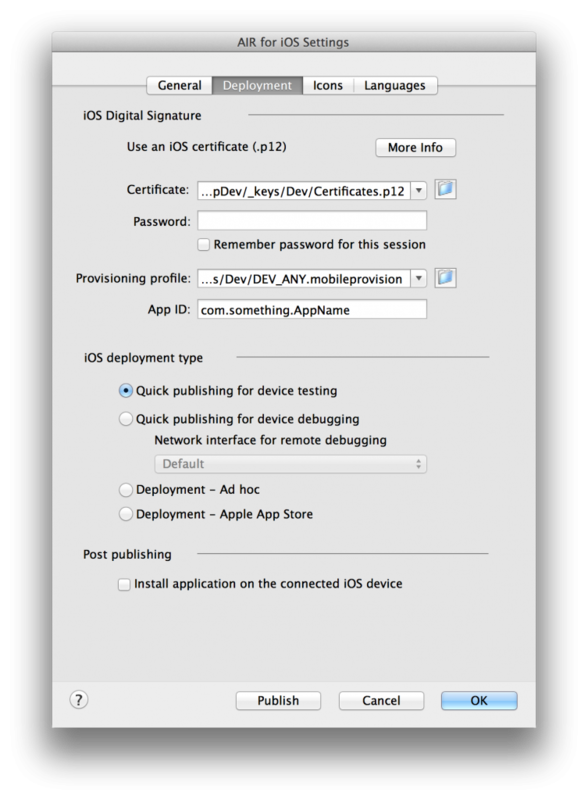 The App ID name needs to be the same as you set it up in the IOS provisioning section of Apples iOS dev site. If you are manually managing your xml file, you’ll need to manually make the adjustment.